This week’s lesson, “Discipling Spiritual Leaders”, is an apologetic for the Adventist church structure more than it is a biblical lesson on making leaders. “But when the Helper comes, whom I will send to you from the Father, the Spirit of truth, who proceeds from the Father, he will bear witness about me. And you also will bear witness, because you have been with me from the beginning” (John 15). Jesus said that those who abide in Him—and He clearly taught that this “abiding” means being born again (Jn. 3:3-6)—will be recognized as His disciples, and moreover, they will be hated for their loyalty and defense of Jesus. The quarterly’s talk of “spiritual leaders” is vague and a bit pompous; those who are doing the work of the witnessing and defending Jesus are the average, everyday believers. And they will suffer. There is no such thing as a true disciple of Jesus who does not suffer. Jesus IS the knife that divides between the most intimate family relationships (Matt. 10:34-36). “Truly, truly I say to you, the servant is not greater than his master, and he who is sent is not greater than the One who sent him” (Jn. 13:16). All believers are called to make disciples of all nations. No Christian is exempt—and this disciple-making requires that those being discipled are true believers in the biblical gospel. 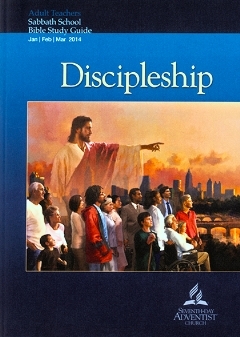 There is no other kind of disciple allowed in Scripture. Copyright 2014 BibleStudiesForAdventists.com. All rights reserved. Revised March 10, 2014. This website is published by Life Assurance Ministries, Camp Verde, Arizona, USA, the publisher of Proclamation! Magazine. Contact email: BibleStudiesForAdventists@gmail.com.